The Belgium textile machinery manufacturer VANDEWIELE (Hall 3 / Stand C01), together with its member companies Bonas, Cobble and Superba, will present a broad range of latest innovations at the coming ITMA Asia + CITME 2018 in Shanghai. Highlights include a new type of Velvet Smart Innovator VSi for plain and jacquard velvets, latest Jaquard machine installations from the Si and Ji range as well as recent improvements in SUPERBA’s space-dyeing technology. BONAS, trendsetter in jacquard weaving, will present their latest innovations at ITMA ASIA 2018. 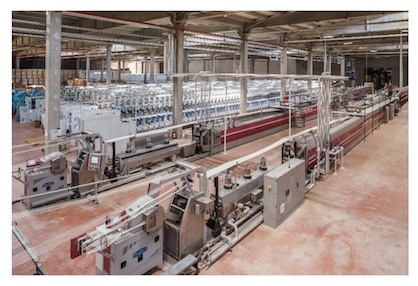 The Si range, known as trailblazer in jacquard weaving thanks to its most compact design, lightweight, low energy consumption and high efficiency is now available from 2.688 up to 31.104 hooks, the largest single jacquard machine available on the market. On the VANDEWIELE booth you can discover the Si27 on an Itema R9500-340 cm with 27.200 installed hooks, weaving wall covering & bed covers. To date, numerous Bonas Si’s with over 25.000 hooks are installed in the market, weaving a wide range of applications. The Bonas Si range is used for all applications on all possible jacquard Air jet, Rapier and Velvet looms. The performance and stability of the Si is demonstrated while weaving OPW airbags at high speed, with 11520 hooks, on a Dornier Air Jet. The double-sided drive mechanism proves its usefulness. Bonas’ other successful Jacquard range, the Ji, is of course displayed as well. This model is available from 1.920 up to 5.760 hooks. The Ji is manufactured in a state-of-the-art factory in Belgium as well as in a brand new plant in Nanjing. Nanjing is producing exclusively for the Chinese market. Hundreds of Ji’s are installed in several countries for numerous weaving applications. 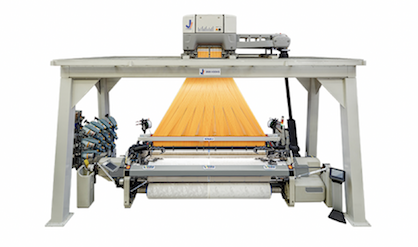 At ITMA Asia, a Ji5 equipped with 5.000 hooks will weave furnishing fabrics on a Picanol GT Max-340 cm. A Ji2 with 2688 hooks will produce terry towels on a Rifa Air Jet. Another 6 Ji’s will be on display at the exhibition weaving from label over terry to furnishing fabrics. Bonas’ Ji range, already producing in many countries worldwide, uses the best jacquard technology. The synergy of the micro-selection technology and the state-of-the-art, maintenance-free drive mechanism with integrated dwell, makes the Ji the reference in jacquard double width weaving. Superior technology at the best price. All the machines are equipped with the latest BONAS Ci Controller. The Linux based BONAS Ci controller and software offer solutions for every weaving application. Use of icons on a 10.4” touch screen is user friendly, self-learning and makes operation very easy and self-evident. The Ci controller is Industry 4.0 compliant and hence ready for the future. VANDEWIELE is proud to present as a world’s first the 3 meter execution of the Velvet Smart Innovator VSi for plain and jacquard velvets. The main specs of the machine include parallel reed motion, reinforced cross members, single beams over the full width and up to 24 servo driven smart frames. The new showpiece in carpet weaving is the “HCiX2” in reed 1500 dents per meter, 8 colour frames (1500/8). This high density carpet weaving machine, available in 3 and 4 meters width, is able to weave carpets with up to 5 million points per square meter, creating niche high end products, with a handmade look. The same machine is able to weave carpets in reed 750 dents per meter, using 16 colour frames. More colours or effects can be created using a filling selector. VANDEWIELE Spare Parts Service offers technical assistance to all customers for the order and delivery of original VdW parts. Technical assistance is provided with fast response and genuine parts are delivered within short delivery times. These original spare parts, of course assured of VANDEWIELE’s high quality standard, will increase efficiency of looms and extent life time. A key development of Cobble is the Individual Pile Delivery (IPD) for the Colortec tufting machine, giving a more even pile surface of the tufted carpet, resulting in less yarn consumption. The Colortec, in combination with the in-house developed software TuftLink, is able to produce carpet with multiple density and color gradients. Also, it is perfectly suitable for the production of imitation hand-tuft qualities up to 4.2 kg/m², even with combinations of different yarns. On the Myriad tufting machine, designs of 240 m² without repeat are possible for wall-to-wall side matching. The Myriad is available up to 1/12” gauge and can be equipped with double sliding needlebar. All Cobble tufting machines are available up to 5 meters width. Fabric samples of all these machines will be presented on the VANDEWIELE stand. SUPERBA S.A.S (France), member of the VANDEWIELE family of companies, is the world leader in space dyeing and heat setting machinery for carpet yarn (PP, PES, PAN, WOOL & blends). Present on the Chinese market since 1992, SUPERBA is having a subsidiary in Shanghai (SSRO) with sales & technical Chinese people, as well as a stock of spare-parts to ensure a high level of service to local customers. The Chinese market has recovered a satisfying level of activity since 2016 and the number of SUPERBA heat-setting lines sold has increased accordingly, not only to existing companies willing to extend their production capacity, but also to new prospects. The Chinese carpet market is currently focused on the use of polyester and polyamide fibers to manufacture rugs; one of the current favorites is the tufted printed carpet for domestic market. This kind of carpet requires a well-defined pin-point effect to get a precise printed drawing. SUPERBA TVP3 heat-setting line offers the highest pin-point definition with their saturated steam process. The recent improvements in SUPERBA’s space-dyeing technology, like bicolor printing, or dyeing polyester yarn, are likely to arise great interest among the Chinese manufacturers looking for innovative end-products.